This Sunday is Remembrance Sunday. It’s the Sunday closest to Armistice Day on November 11th, the end of the First World War hostilities in 1918. It’s also a chance for us all to remember, commemorate and pay our respects to those who’ve fought for the freedom we enjoy on a daily basis. The Sun have released an app which will let you build a virtual poppy field and to share poppies through your social media channels or wear them on your smartphone. You’re invited to make a donation to the British Legion and you can also use the “My Poppy” app (available for Android or iPhone) to take a “Poppy Selfie” like this..
More details on the app and how to get it below.. In the lead-up to Remembrance Day, a century after World War I began, The Sun has launched My Poppy, a smartphone and desktop app dedicated to keeping the spirit of Remembrance alive in today’s digital world. Created by The BOX – part of News UK’s group of creative agencies Team News – the app generates a virtual poppy for users to save to their smartphone’s home screens and share with friends on Facebook and Twitter ahead of November 11th, in support of the Royal British Legion’s Poppy Appeal. 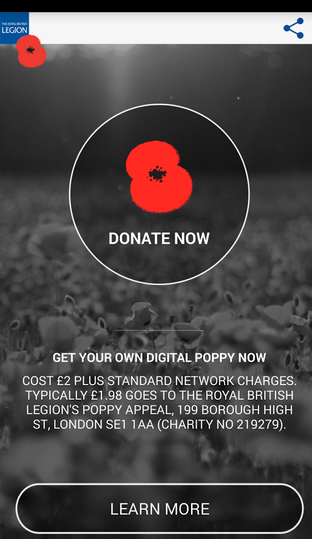 Users are invited to make a one-click donation to the Royal British Legion, the Armed Forces and Remembrance charity, with each donation automatically planting a new poppy in a virtual field, which users can see growing daily in size through the app. My Poppy also encourages users to take and share a ‘Poppy Selfie’, and to download the Royal British Legion’s appeal single by Joss Stone, ‘No Man’s Land (Green Fields of France)’. The launch of My Poppy, dedicated ‘To the memory of the fallen and the future of the living’, coincides with a print advertising campaign from The Sun, also created by Team News, and an editorial feature in the newspaper, rallying the nation in Remembrance of those who have given their lives for Britain since WWI. My Poppy is available on Android and iOS, across desktop and mobile platforms.